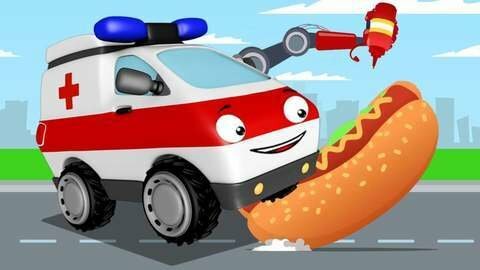 Enjoy this fun car cartoon for children about the hungry Ambulance who follows the Hotdog stand that the crane is pulling. The Ambulance is so hungry that it bullied the two cars into giving their hot dog sandwich to her. She has her eyes set on the huge hotdog sandwich but when she tried to take it, she causes a lot of mess on the road. Keep watching other episodes of car cartoons by going to Kivitu.com.